Daniel had a choice when he died 200 years ago, he decided to stay attached to the world of the living, fighting off the Nightmares that haunt sleeping people every night. When his new assignment is a sixteen year old, depressed girl named Kayla things get out of hand quickly. Although the premise was very original, it got me thinking straight away. If only a fraction of the dying people chooses to become these Protectors of the Night, and training takes over a century, then how would everyone have two of them (considering that they are really dropping like flies). Since these Protectors are dead, why do they need to live in an apartment and steal decorations? How come no-one notices them living in apartments and all. While these questions and more where in the back of my head I was still really enjoying reading it. Unfortunately there was an overdose of instalove and main character Kayla was a special snowflake if I ever saw one. Things got a little bit confusing near the end, but I'm curious to see what the next book in the series will bring. 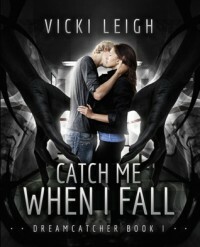 Catch me when I fall is the first book in the Dreamcatcher series.